Earlier in the year Norwegian rock/metal band @Fastloaders successfully crowd-funded their album Ninja Musicology – a triple CD containing guitar based covers of the original sound-track from the iconic Commodore 64 trilogy The Last Ninja. Underworld Club in Camden, London, UK. Doors open 6pm, and after the gig there is a meet and greet with the fans, Ben, and the equally legendary @MattGray. 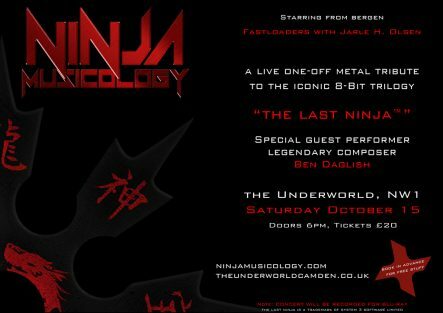 Tickets can be purchased from @C64audio.com (where you can also download a free @Fastloaders audio sampler) or via the venue – The Underworld. Ninja costumes optional! Don’t forget your earplugs! Ninja ROCKS!